Drill Gage is a useful guide for identifying drill bit sizes; extremely helpful when working with older, unmarked drill bits, as well as with bits that are too small to fit diameter markings. Measures bits from 1/16" to 1/2" x 64ths metric range from .062 to .500mm; made from heavy duty stainless steel with black etched graduations. Includes (1) each: 1-1/4", 1-1/2", 2", 2-1/8" and mandrel. Made of hardened, high-carbon steel for strength and durability when working in applications such as covering fastener holes in furniture, cabinetry, floors, decks, or making dowels; 1/4" inch shank. Allows accurate installation in wood doors by adjusting easy guide template arms to desired door thickness and backset sizes. For door sizes: 1-3/8" and 1-3/4". back set sizes: 2-3/8" and 2-3/4". The hole sizes and decimal equivalents are permanently etched on face so they won't wear off with repeated use. Number size drills 61 to 80. Fractional size drills 1/16" to 1/2" x 64ths. Metric range from .062 to .500mm. This gage has been crafted to meet government specifications. High speed steel teeth for fast and clean cuts through wood. Tooth design allows for a more aggressive cut and holds more chips. Includes (1) one each: 1-1/4", 1-1/2", 2", and 2-1/8" saws and a mandrel. Cordless trim saw blade has an ultra thin kerf and is designed for use in construction and remodeling. Laser cut blade features a thin kerf, this makes it good to use with portable and low powered saws on the jobsite. Alternate top bevel., 12,000 RPM, +5 degree hook angle, .039" plate, .049" kerf. Carbon hole saws for wood doors, fits all interior and exterior doors, self centering jig fits all common door widths, adjustable for both 2-3/8" and 2-3/4" backsets. Includes: double sided jig, (2) carbon hole saws, 3/8" mandrel, bolt plate template, custom router bit, and hinge plate template. For use on wood doors. Includes: positioning template for marking hole location, drill guide for accurate pilot holes 2-1/8", hole saw blade for fast cuts in hard woods, 1" spade bit for drilling edge bores, mandrel 3/32", Allen wrench, 1" wood chisel, 5/32" pilot drill centering template. Cordless trim saw blade has an ultra thin kerf and is designed for use in construction and remodeling. Laser cut blade features a thin kerf, this makes it good to use with portable and low powered saws on the jobsite. Alternate top bevel., 12,000 RPM, +5 degree hook angle, .039" plate, .049" kerf. Allows accurate installation in wood or metal doors by adjusting easy guide template arms to desired door thickness and backset sizes. For door sizes: 1-3/8" and 1-3/4", back set sizes: 2-3/8" and 2-3/4". Bi-metal hole saws for metal and wood doors, fits all interior and exterior doors, self centering jig fits all common door widths, adjustable for both 2-3/8" and 2-3/4" backsets. Includes: double sided jig, (2) bi-metal hole saws, 3/8" mandrel, bolt plate template, custom router bit, hinge plate template. Allows accurate installation in wood or metal doors with the two most common sizes for accurate installation. Attached pass through shank arbor, variable pitch positive rake teeth reduce vibration and clear chips, M3 cutting edge is longer lasting and teeth are shock resistant. Includes (1) each: 1", 2-1/8" high speed steel hole saws and 4-5/16" pilot drill. Compact injection molded hole saw kit box with carrying handle. Three trade specific configurations contain the most commonly used sizes. Utilizes C-clamp design with tool free clamping and no surface damage, compatibility for the two most common backsets and door thicknesses. Includes: 1", 2-1/8", mandrel, adapter, drill guide, replacement parts (including two additional pilot point centering bits), two adjustable bushings which accept both standard backsets and both common door thicknesses, and new quick change mandrels (DW1803 and DW1810) for increased user productivity. For tighter access with your current Impact driver. Magnet secures fastener. 1/4" shank. You can adjust the Drill Guide in 5 degree increments from 0-45 degrees, left and right. V-Guides for drilling through rounded stock or dowel, positive stop for accurate drill depth and centering channel on base for edge drilling. Attaches to all 3/8" and 1/2" power drills. Folds for tool-box storage. Compact attachment measures 2" wide, allowing it to fit in tight, difficult to reach places. Durable all metal housing and steel gears with ball bearing construction allows the adapter to handle up to 235 in-lbs of torque. Allows you to drive screws and drill bits in tight, difficult work areas. For use with cordless drills; convenient quick change chuck accepts standard 1/4" hex drive accessories, Drills clean wood, nail-embedded wood, plastic, aluminum, metal, cast iron and stainless steel. The Diablo 9 piece hole saw kit features (5) bi-metal hole saw cups, (1) piece SnapLock Plus mandrel, (1) pilot bit and (2) adaptor nuts (1/2" and 5/8") for quick and easy hole saw cup changes for maximum job performance. This new, high performance hole saw set delivers faster cutting performance and increased productivity versus standard bi-metal hole saws. Diablo's hole saws and ShapLock Plus mandrel system simplify the attachment process for fast and efficient hole saw mounting. 60 mm (2-3/8") cutting depth for 40 percent deeper holes in 1 pass and increased productivity. 1-size fits all mandrel, fits all Diablo hole saws from 5/8" to 6" diameter. Tool free plug ejection for fast material removal. Variable tooth design provides faster cuts with less vibration. Sizes included: 7/8", 1", 1-1/8", 1-3/8", 1-1/2" and 2". Also includes Mandrel, Pilot bit, 2 Adaptor Nuts and a heavy duty durable case for easy and convenient storage of hole saws. Bi-metal construction and hard steel RC 65-66 for long life; 4/6 variable pitch teeth for reduced noise and improved performance with clearly printed hole saw sizes for quick retrieval. Includes (1) each: 7/8", 1-1/8", 1-3/8", 1-3/4", 2" and 2-1/2", (1) each: 1/2" hex shank, 3/8" hex shank, pilot drill and carrying case. Ice Hardened cryogenically treated for longer life. Optimized tooth form for faster cutting. Wide, angled and offset slots for easy plug access. Bi-metal construction with 8 percent cobalt for increased wear resistance. Kit includes: (1) 1-1-2" Ice hardened bi-metal hole saw, (1) 1-1-8" Ice hardened bi-metal hole saw, (1) 1" Ice hardened bi-metal hole saw, (1) 1/8" hex key, (1) 3/4" Ice hardened bi-metal hole saw, (1) 7/8" Ice hardened bi-metal hole saw, (1) Hole saw adapter, (1) 1/4" x 3-1/2" high speed steel pilot bit. Also includes convenient case for organization and transport. No arbor required. The continuous, brazed edge lasts longer in tile and stone. Over sized slot in hole saw for easy plug removal with low torque, little pressure required for fast, easy cutting. Includes: 3/16", 1/4", 5/16", and 3/8". Turns any drill into an angle drill. Fits into drill chuck like you would use a drill bit. Use in hard to reach areas with drill bits, wire brushes, polishers and grinding discs. Completely sealed, never needs lubricating. Not for use in hammer drills. Includes: Jacobs 3/8" chuck Tungsten carbide grit set includes: 1-1/4", 1-3/4", 2-1/8", 2-1/2", arbor and pilot bit. Cuts ceramic tile, concrete block, cement board, brick, fiberglass, plexiglass, PVC, wood with nails, cultured marble and drywall. Ice Hardened cryogenically treated for longer life. Optimized tooth form for faster cutting. Wide, angled and offset slots for easy plug access. Bi-metal construction with 8 percent cobalt for increased wear resistance. Kit includes: (9) hole saws; 3/4", 7/8", 1-1/8", 1-3/8", 1-1/2", 1-3/4", 2", 2-1/8" and 2-1/2", (2)arbors; 49-56-7010, 49-56-7250, (2) pilot bits; 49-56-8010 (assembled with arbors). Also includes convenient case for organization and transport. Engineered to maximize runtime. Thin kerf design for high efficiency. Carbide teeth for long life. Self-feed pilot bit for fast, efficient cutting. Spring loaded collar automatically engages drive pins to prevent hole saws from locking to the mandrel. Kit includes: (3) hole saws - 2-1/8", 2-9/16" and 3-5/8", (1) Quick change Mandrel and (3) Self-feed Pilot bits. Includes hole saws: 7/8", 1-1/8", 1-3/8", 1-1/2", and 2", Snap-Back 2L and 5L and carrying case. Utilizes a deep cut technique, which broadens functionality by increasing the variety of widths the saw is compatible with; tooth and set guide, broad, toughened backing plates that avoid marring around the bores. Bi-metal section made from M3 steel for added protection against jobsite abuse. Includes (1) each: 7/8", 1-1/8", 1-3/8", 1-3/4", 2, 2-1/2", small Quick Change mandrel, large Quick Change mandrel, replacement parts and a rugged kit box. Aggressive tooth geometry, deep gullets for easy plug removal. Three hardened steel teeth provide maximum durability against unintended nail impacts; cuts up to 600 holes in wood without needing to be re-sharpened. Includes: (3) hole cutters: 2-1/8", 2-9/16", 3-5/8", (1) arbor with pilot bit, (2) pilot bits, (1) diamond file, (1) hex wrench and impact resistant case with storage space for additional hole cutters. High speed steel teeth are reinforced to cut stronger, last longer, resists tooth strippage and withstands high torque. Includes (1) one each: 7/8", 1-1/8", 1-3/8", 1-3/4", 2", 2-1/2", arbors: 2L, 5L and carrying case. SnapLock plus mandrel system for quick and easy change with no down time. First carbide hole saws that allow operators to cut wood, nail embedded wood and metal using the same hole saw cup. 10 times faster cutting in hard materials. Tool free plug ejection for fast material removal. Variable tooth design delivers faster and easier drilling with less operator effort. 2-3/8" cutting depth for 40 percent deeper holes in 1 pass and increased productivity. For drilling wood, plastic, aluminum, metal and stainless steel. Carbide tipped. Set includes: (1) 1", (1) 1-1/8", (1) 1-3/8", (1) 1-1/2", (1) 2", (1) Mandrel, (1) Pilot bit and (2) Adapter Nuts - 1/2" and 5/8" thread. Drills clean wood, nail-embedded wood, plastic, aluminum, metal, cast iron and stainless steel. 60 mm (2-3/8") cutting depth for 40 percent deeper holes in 1 pass and increased productivity. Delivers faster cutting performance and increased productivity versus standard bi-metal hole saws. 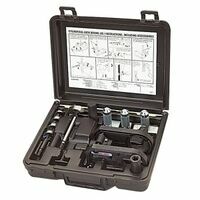 This set includes a heavy duty durable case for easy and convenient storage of hole saws. 1 size fits all mandrel and Diablo saws from 5/8" to 6" diameter. Tool free plug ejection for fast material removal. Variable tooth design provides faster cuts with less vibration. Includes: (10 cups) size: 7/8" 1", 1-1/8", 1-3/8", 1-1/2", 1-3/4", 2", 2-1/8", 2-1/2" and 2-9/16". Also includes Mandrel, Pilot bit and (2) Adaptor nuts. High speed steel teeth are reinforced to cut stronger, last longer, resists tooth strippage and withstands high torque. Includes: (1) one each: 7/8",1", 1-1/4", 1-3/8", 1-1/2", 1-3/4" 2-1/8", (2) arbors 5L, 6L, (1) pilot drill and carrying case. Matrix II Bi-metal teeth, ice hardened for longer life, positive rake angle for fast cutting, radius tooth back reduces stress on teeth, deeper gullets for fast chip removal and functional slot geometry provides easy plug removal. Includes: 1", 2", 2-1/8", and 2-1/2" Bi-Metal Hole Saws; 7/8", 3/4", 1-3/8", 1-1/2", 1-1/8", 2-1/4", and 1-3/4 Hole Dozer Bi-Metal Hole Saws; 3/8" Hex Shank Arbor, (2) 3-1/2" Pilot Bits, 1/8" Hex Key, and 7/16" No Wobble Arbor.